"This storm is unique in that it brought a significant storm to Seattle and a wintry mess to so many big cities - Chicago, Detroit, New York and Boston," Roys told USA TODAY. "When you include the South, the storm is impacting almost every part of the United States in some shape or form." Almost a third of the nation's population was under some form of severe weather watch or warning. Over 105,000 homes and businesses were without power in Washington state alone. More than 650 flights in and out of New York's Kennedy and LaGuardia airports were canceled or delayed. Commuters across most of the nation's northern tier were also affected. Green Bay, Wisconsin, could see 10 inches before the snow stops. Parts of Michigan were paralyzed by freezing rain. "Expect your drive to be at least twice as long this am," Michigan's Transportation Department warned Detroit commuters. "Icy rain making for tough driving conditions. SLOW DOWN!" "Please take today's winter weather seriously," he pleaded. "Stay indoors whenever possible, use public transit if it is available to you and check on your vulnerable neighbors." Schools in Seattle and across much of the area were shuttered for a second straight day Tuesday. The city, which averages less than 7 inches of snow a year, already has seen three times that amount. Boston's snow total since Jan. 1: 2.2 inches. Seattle: 20.2 inches. A mix of rain and snow continued to fall Tuesday. 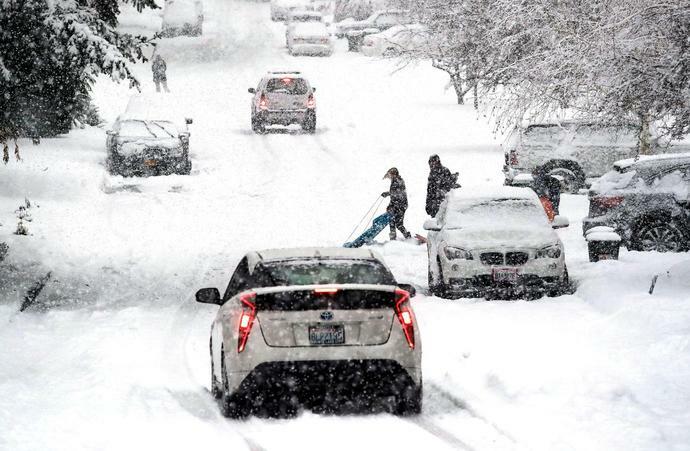 This has been Seattle's snowiest February on record, the National Weather Service reported.